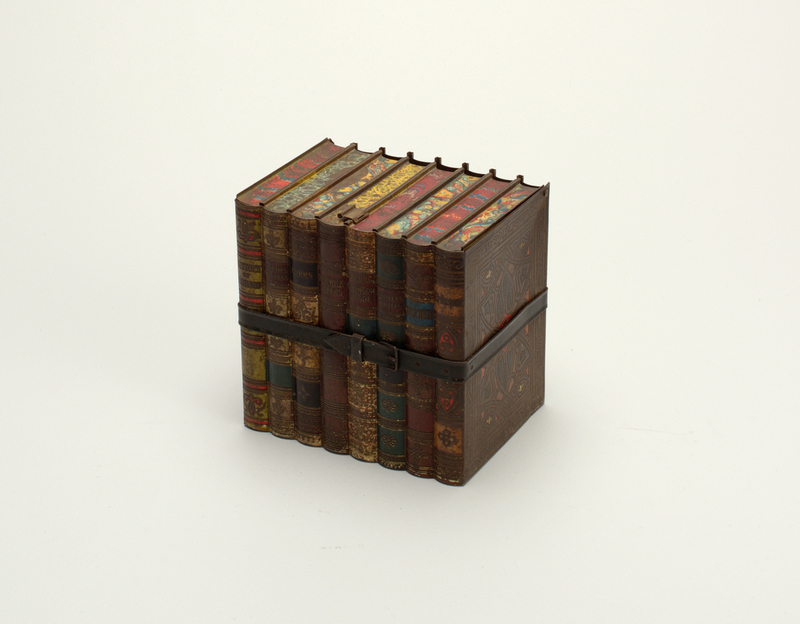 This trompe-l’oeil biscuit tin takes the form of a stack of books with handsome marbled pages and tooled leather bindings. The titles include some of the most ubiquitous texts in British history, from the moralistic Pilgrim’s Progress to the adventure stories of Daniel Defoe and Jonathan Swift. The books are a play on the name of the place where the tin and its cookies were once produced— the town of Reading, located west of London. The Huntley and Palmers biscuit company began in 1822 as a small bakery that was fortuitously located across the street from a busy stagecoach inn. The biscuits were popular with travelers but were prone to breaking on bumpy roads in the era before coil spring seat suspension. In 1832, the founder Joseph Huntley’s son, a metalsmith also named Joseph, began making tin boxes in his nearby workshop. These not only preserved the crumbly treats but proved to be an incredibly effective marketing tool. Soon, the company was producing decorative tins in a range of collectable novelty shapes including grandfather clocks, Syrian tea tables, and globes. The invention of offset lithography allowed colorful designs to be printed directly onto tin, heralding a new age of packaging design. The rapid expansion of the railway and steamship travel provided the company with a consumer market as vast as the British Empire itself. By 1900, Huntley and Palmers was the world’s largest biscuit manufacturer and the town of Reading, whose population had soared in response to labor demand, became known as “biscuit town”. The company went on to supply biscuits to the ill-fated British Antarctic expeditions led by Captain Robert Scott in 1910-1913, and to the British army during WWI.